Coming on the heels of visits to Israel by Geert Wilders and a delegation of other luminaries of the European anti-Muslim right, Adar Primor of Ha’aretz interviewed Marine LePen, the daughter of Jean Marie LePen and likely the next leader of the National Front (“The daughter as de-demonizer”). Like the other European anti-Muslim politicians, Marine LePen claims no animosity toward Jews, but the interviewer, Adar Primor, is clearly suspicious—unwilling to remove the “mark of Cain” that all European nationalist politicians inherit as the result of the centrality of the Holocaust in the contemporary European political landscape. Nevertheless, her views, particularly on Israel, set her apart from the other notables on the European right. She mentions particularly public displays of Islam—closing streets for high-decibel prayer meetings and women wearing head scarves in lieu of the recently banned niqab and burka. Like Wilders, her objections to Islam are not phrased in terms of seeing them as racial aliens but as unwilling to conform to secular French culture. Distancing herself from the BNP, she claims the National Front is “neither racist nor xenophobic but simply a ‘patriotic’ party.” Islam is fine but Islamization is not. France is “one of the least racist countries in the world. People aren’t judged here according to their color or their religion, but according to their qualities.” Like Wilders, LePen comes across as a libertarian who advocates a meritocracy, abolishing affirmative action, and evaluation on the basis of individual qualities rather than group membership. If we were to say in France a thousandth of what they say in Israel on the subject, we would immediately be thrown into prison for incitement to racial hatred. In practical terms, the country must adopt a preventive and effective immigration policy, which would include putting the employers of foreigners on trial and imposing heavy fines on them. You also have to implement the idea of national preference, and abolish all the incentives that attract migrants, for example social welfare, education for the children, health and housing services. 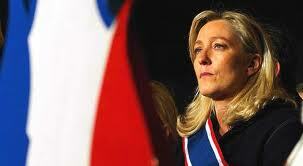 LePen seems to realize that the National Front is not going to get the support of Jews either in France or in Israel. Indeed, the Israeli government has prevented her from visiting, and the French Jewish community has also rejected her overtures and her pledge to “turn over a new leaf” by rejecting her father’s statements on the Holocaust and other aspects of history. (In 2005 she almost left the party when her father claimed that “the Nazi occupation was not particularly inhumane.”) Present and former leaders of the organized Jewish community in France worry that she is more dangerous than her father because she is more likely to appeal to mainstream moderate right voters. Given the lack of Jewish support, she has opted to take a position on Israel that is well within the European mainstream by emphasizing how intolerant and racist the country is. Such rhetoric fits in well with EU criticism of the Netanyahu government, the settlements, and the Gaza embargo and should resonate with French voters. Marine LePen exemplifies the trend toward European nationalist anti-Muslim parties to provide at least a veneer of philosemitism. As with Geert Wilders and the others, the National Front will get no help from Jews. 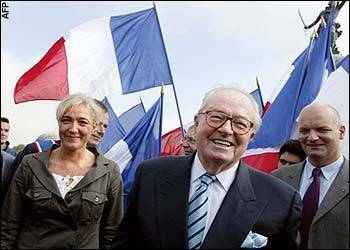 The rise of the National Front and the other European nationalist parties is a huge breakthrough for the movement to reestablish a sense of European culture and eventually European peoplehood. 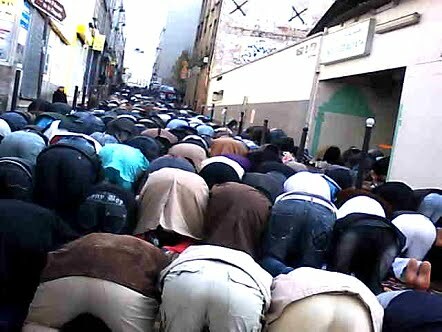 It’s obvious that Muslims will never become the good liberal republican Europeans that LePen says she wants them to be. As a result, the success of these parties means that Europe would have a renewed sense of cultural identity. It would then be a short step to the realization that some cultures are simply unable or unwilling to adopt contemporary liberal European values. Europeans would be much closer to the realization that their individualist, libertarian tradition is fundamentally at odds with pretty much the entire rest of the world.